Dan Paymar is not just a poker player who has decided to write a book. He is a poker dealer instructor and certainly knows lots of secrets and tricks that make the game. In this book Dan decided to cover many vital aspects of the game that will bring you success. It’s no secret that one video poker machines bring more wins than others. Dan teaches you how to choose the right one and avoid deceptive machines. You will know how much you should bid and when you should bid without keeping in mind long tables. Dan calls this precision play – a video poker play that is optimized and maximized for receiving max profit. After the successful first edition of this book Dan Paymar has decided to release a new one. This edition provides not only new hands and fresh video poker strategies, but also includes Dan’s Attractiveness Index that brings the light on new games that have appeared on the market since first edition of this book. Dan Paymar plays video poker since its appearance. He decided to move in Las Vegas in late 80’s where he first tried playing this game. Earlier Dan was known as a casino and gambling observer and his reviews were published in magazines. Dan noticed quickly that most of the video poker strategies of that time were ineffective and could be applied only in particular cases. He decided to use his knowledge of computers and make a deep analysis of the game. 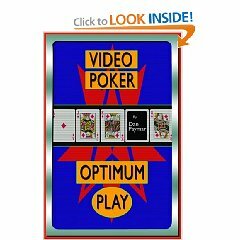 As a result a first edition of this book “Video Poker – Precision Play” appeared. That book was a best seller, but also it showed that some aspects should be described in details. Since that time Dan has released 10 successful editions.